My dad turned 70 this year. A few weeks before his birthday I emailed all of the family and asked people to email me something they love about him. I thought of putting them together in a book but knew it would end up sitting on the shelf. My husband came up with the idea for a collage. 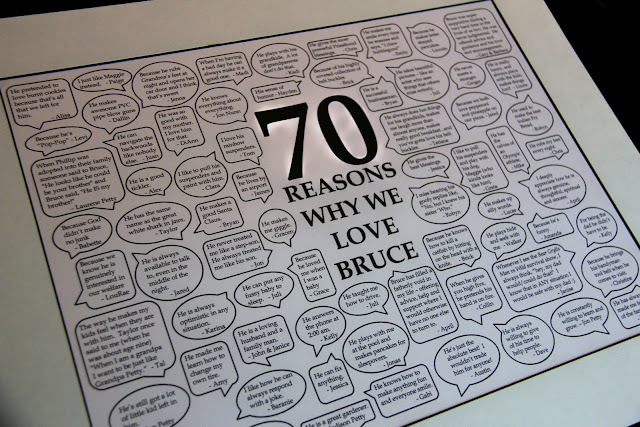 So, I created a document that said, "70 Reasons Why We Love Bruce" with little talk bubbles. I got almost double the responses but included at least one from each person then printed the total list for him. I printed the document 12 X 16, matted it, framed it and shipped it off. I wasn't able to be there for his party but I was told there was laughter and tears as he read through each one. It was a great reminder, as I saw all of the responses coming in, of how wonderful a man he is and just how much he gives to others. I hope he treasures it. I know many of you have asked for the template and I sent it out to a few. But, my hard drive has since crashed and I no longer have the file. I'm sorry I can no longer share it. What a great idea. I'd like one of these right now just for me. You know , for those days when things don't look so good. I pinned this for later. Thanks for sharing. Oh really very nice idea for giving memorable thing... Thank you for shear with all of us. and salute to your gift idea, now you can easily send birthday gifts to India for your love one. What a thoughtful, memorable gift. I would buy a template if you sold one. Would be great with a picture in it too. Great idea, you are so clever! Did you ever get a template of this that your could possible share with me? no template still to share?? Can i get one also?? :) 70 reasons why we love clifford. Awww u wud help me a ton...yet i understand if thats too much to ask...or just the 70'with the bubbles wud be neat floomicreations@googlemail.com. Please see the new red comment above. Please see new red comment above. Hi ya, Lovin this idea! what a Awesome gift. Please see new red comment in the post. What a great post! I'd love to also get the template if you're willing to share. My father is turning 70 next month and I'd love to do something extra special like you did for your dad. By giving gift we expressed our way of love to our dear and near ones. It is the symbol of our affection because mostly we will give what our loved ones like. Love this.. could you send the template?? Is there any way you can share the file so I can use it? My father-in-law is turning 70 and this would be perfect! love love this!! super creative and thoughtful!! how do you print it out? do you have a template? would love some advice! Can I fill it in and take it to Kinkos? Haaaaaa, people are so DUMB. I just pinned this to make for my dad's birthday coming up this summer! This is SUCH a great idea. If it is working and all those people are getting the template, I would love it as well. thedoerens@msn.com I have been thinking through how I would pull this off. Thanks! Can you please share the template with me? Could I PLEASE have the template!! Legendaryspeech1@gmail.com Thank you!!! Amy, this is really cool. What software did you use? Did you just create this in a Word document? I'm trying to recreate something similar and would love to know what you started with. Was this a template that you actually created, or is it established somewhere? If you created it, can you at least share the program you used and maybe we can all create our own? Thank you. I created the template myself in Microsoft Powerpoint. They have conversation bubbles you can move wherever you want and then put a text box inside them. It was pretty simple. There are various gift ideas for birthday like a bouquet of flowers, a basket containing delicious chocolates and flowers, a showpiece or a birthday greeting card. These days, personalized greetings and gifts are in vogue because of additional personal touch. You can add your personal pictures to revive some memories and can add your own words through personalisation. My last order was from the 'Post My Greetings' and i am totally satisfied with their gifting services. Thanks to the team of professionals that made my work so easy by delivering the flowers to Uttar Pradesh on my behalf in a perfect shape. Birthday is a special day in every one’s life. Each one celebrates the day in an unique manner.Wishing with gifts is a good idea. does anyone have this template?????? I'm planning my mom's 70th! thanks! Fonts! Would you share what font and size font you used? 12x16? Was that difficult to frame or expensive? This is a wonderful idea! Thank you...I am going to use it for my Dad's 60th birthday! I know you no longer have the template, but can you please tell me how you got the layout to those dimensions on power point--not sure how to do that! Also, what font/size did you use?? Thank you in advance!!!! Great idea!! I just wanted you to know that I purchased a copy of the template from you and that it turned out fabulous. The hardest part was getting 70 people to comment, but some people wrote long letters with many things in them so I was able to use them 2-3 times. I gave it to my brother at his 70th birthday party and he was touched. He has ALS and it is hard to know what to give him. Besides the framed photo I also gave him a file of it so he could read it on the computer, as he does that much better than looking at a picture on a wall. I want to book most beautiful Banquet Halls for my birthday party celebrations. Does anybody know any great location for my birthday party? Please help!! Hi all. Just wanted to let you all know that I have this template set up in MS Publisher ready for you to fill in the comments. You can purchase the template for $5 via paypal. Email me for more info. Is this template still available for purchase from you Wendy?? I just wanted you to know that I purchased a copy of the template from Wendy Lynch and that it turned out fabulous. The hardest part was getting 70 people to comment, but some people wrote long letters with many things in them so I was able to use them 2-3 times. I gave it to my brother at his 70th birthday party and he was touched. He has ALS and it is hard to know what to give him. Besides the framed photo I also gave him a file of it so he could read it on the computer, as he does that much better than looking at a picture on a wall. Find the best birthday gift ideas among wide range of collection to buy personalized gifts.Find unique and Personalised birthday gifts for everyone on your list.